When I was a child, December was baking season around our house. My mother would bake cookies almost every day, so we’d wind up with a dozen or more varieties at least. Between Christmas and New Year’s, she’d serve up a big platter of them every night after dinner. I’d always beeline these Crunch Drop Cookies, made festive with a garnish of brightly colored sugar or sprinkles. They’re a great tasting cookie, and easy to make. Almost every kid will like them. And you? Well, you may experience your second childhood. 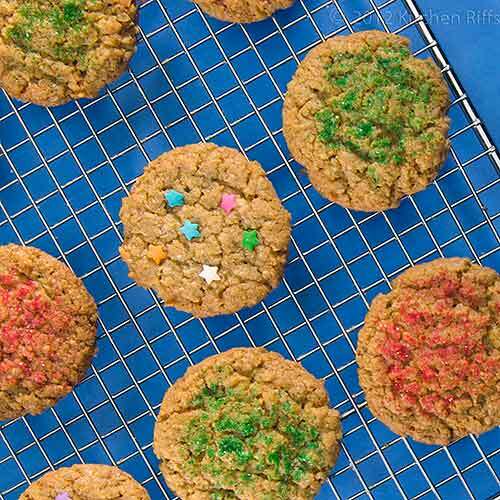 These cookies are made with two breakfast table standbys, Rice Krispies® (or a similar crisp rice cereal) and quick-cooking oats (the “1 minute” kind). Coconut adds extra flavor and sweetness. Mrs. Kitchen Riffs — the cookie baker in our household — and I decided to go with name-brand cereals when she made these, but I would imagine store brands would work well too. It takes about 20 minutes to mix the cookie dough, maybe 5 minutes more to form the cookies on a baking sheet, and 12 to 15 minutes to bake each sheet of cookies. The recipe makes about 5 dozen (depending on how big you make the cookies), so you’ll be doing several rounds of baking unless you have multiple ovens and lots of baking sheets. Figure a good hour and a half total time for making a whole batch. Leftovers keep well in airtight containers for a week or so. We’ve never frozen these, so we don’t know if that works (they disappear so quickly, we never have any to freeze). Preheat oven to 350 degrees F. Place one rack in lower third of oven, the other in the upper third position. Line baking sheets with parchment paper or silicone baking mats, or grease the baking sheets. Thoroughly whisk together the flour, baking soda, and salt. In the bowl of a standing mixer, cream butter with a flat beater until light and fluffy (you can also use a hand-held electric mixer). Gradually add the brown sugar, then the granulated sugar. Continue beating until the mixture becomes smooth and creamy. Add eggs one at a time, then add vanilla extract, beating well after each addition. Add the oats, then the rice cereal, then the coconut, beating well to combine. With the mixer on low speed, gradually beat in the flour mixture until thoroughly incorporated. Drop rounded teaspoons of cookie dough onto prepared baking sheets, spacing at least an inch apart (cookies spread while baking). To garnish with colored sugar or sprinkles, flatten tops of cookies with a fork (the tines make a nice pattern) or the back of a spoon, and add decorations on top. Bake until the cookies start to become firm (the tops will spring back when touched lightly), about 12 to 15 minutes. Don’t overbake. Cool on a rack, and serve. The recipe that my mother used specifies quick-cooking oats, and that’s what we used because we know they work. At some point, we’re going to experiment using the regular long-cooking rolled oats — the kind we typically buy when we eat oatmeal for breakfast — and see if they work. I imagine they would, but who knows (they do have a somewhat different texture). I suspect that steel cut oats would not work (they usually need a longer cooking time than rolled oats). You should use high quality (pure) vanilla extract in this recipe. 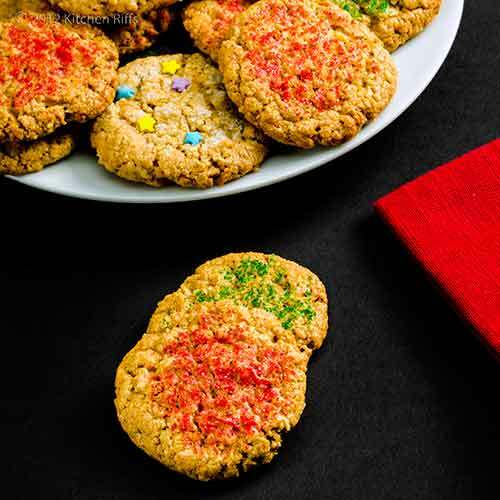 For the holidays, garnishing the cookies with colored decorating sugar or sprinkles adds a festive touch. During the rest of the year, we substitute plain granulated sugar or a cinnamon/sugar mixture. We sometimes make them without a garnish — they’re tasty that way as well. I'd like to thank Ali at Yorkies Girl for awarding me with the Kreative Blogger award. You can read about it here. It'll be awhile before I'll be able to get it together enough to pass the award along to others, but I wanted to thank Ali for her kindness. 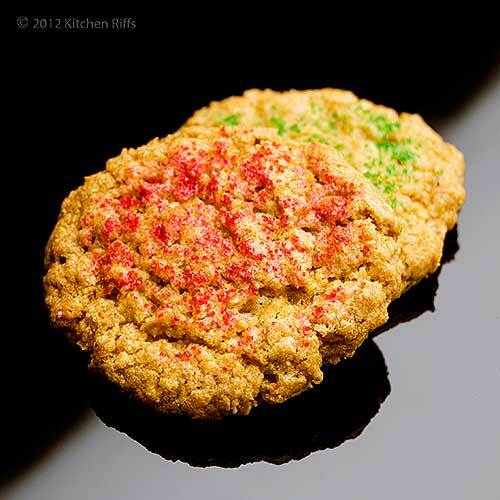 This year on Kitchen Riffs, we devoted the weeks between Thanksgiving and Christmas to posting about cookies and cocktails. Makes sense, don’t you think? This is a favorite time of year for entertaining, so we’re always looking for special treats to serve. And what’s more traditional (or treatly) than cookies and cocktails? In addition to the Crunch Drop Cookies featured today, we discussed Anise Drop Cookies, Almond Sugar Cookies, Coconut Kisses (Macaroons), and Chocolate Pepper Cookies. Need more cookies than that? Our archives have you covered: Pfeffernusse Cookies are a classic for Christmas. Cherry Winks Cookies, Chocolate Drop Cookies, and Peanut Butter Cookies are all holiday appropriate. The cocktails we’ve discussed in the past month or so include The Stinger, the Grasshopper Cocktail, the Brandy Alexander, and the Aviation Cocktail. Looking for additional cocktails? Just dive back into the Kitchen Riffs archives again: Eggnog, The Classic Champagne Cocktail, the Corpse Reviver Cocktail, the Betsy Ross, the Manhattan Cocktail, the Martini, or the Sidecar would all warm up your guests on a cold evening. And for those in the Southern Hemisphere who celebrate Christmas in warm (i.e., hot) weather, nothing is more refreshing than a tall Pimm's Cup. Now that Christmas is almost here, we’re wrapping up our cookies-and-cocktails series with today’s post. But New Year’s Eve is coming up! Later this week and early next, we’ll feature a couple of posts about suitable party fare. And then we’ll start the new year by returning to our regular monthly cocktail post, this time with a drink that is particularly appropriate for recharging after all the season’s activities. Mrs. Kitchen Riffs and I wish you Happy Holidays! I've never had these. Love the crunch in them and the simplicity of the decoration. I'm not really a baker - except during the holidays - so appreciate simplicity. Merry Christmas from my home to yours! The cookies look and sound wonderful. Wishing you and Mrs. Kitchen Riffs Happy Holidays as well. These are a great sounding all around good cookie! And they look like what has often been delivered to our home. Have fun eating them and have a very nice holiday! Hi Claudia, these are really worth trying - really good stuff! I'm not much of a baker, either, but fortunately Mrs K R is! Thanks for the comment, and Merry Christmas! Hi Dawn, they're really great! Thanks for the comment and good wishes, and I hope your holidays are great! Hi Charlie, I think we were both lucky in the way we grew up! Thanks for the greetings and comment, and Merry Christmas to you! Hi Abbe, they're really a nice cookie, and at any time of the year. Thanks for the comment and greetings, and have a wonderful holiday! Hi Alyssa, they're really a fun cookie. Thanks for the comment and greeting, and I hope you have a Happy Holiday! Excellent cookie!! I love the oatmeal, coconut, and Rice Krispies blend, but not the normal Rice Krispies treats. This is an actual superb cookie crunch. They look delicious!! I wish you and Mrs. Riff a joyous holiday and I look forward to your delicious recipes in 2013! Have a happy time with your family and friends! Hi Judy, these are truly nice - a great, balanced flavor with lovely texture. Thanks for the greetings and comment, and I hope you have a wonderful holiday! Hi Marina, what kind of oatmeal cookie did you have as kids? And I agree holiday memories are wonderful. Thanks for the comment and good wishes, and have a great holiday! With oatmeal and coconut as ingredients, I know I'd love these!!! I need to check our supply of Rice Krispies...I just may be able to whip these up soon :) Merry Christmas to you, too! My kids love to eat raw cookie dough and getting pasteurized eggs just because of this risk is a great idea. Your cookies look delightfully crunchy and festive. So how is your freezer storage space doing? You have been making so many delicious cookies what are you doing with all of that inventory? Any overflow you can send to 2 hungry teenagers in Hong kong... LOL Wishing your and Mrs. Kitchen Riff and very safe and happy holiday. YUM! I love the ingredients in this recipe. Anything with coconut has my vote! Hi Lizzy, the Rice Krispies are the hard part - we had to make a trip to the store! Thanks for commenting and the holiday greeting, and I hope you have a terrific holiday! Hi Bam, we've been giving cookies away as fast as we can make them! It's the only way - otherwise we'd both be blimps. I do wish your teenagers lived closer to us - Mrs K R loves to double and triple batches of cookies! Thanks for the comment and greeting, and have a wonderful holiday! Hi Natalie, isn't this a nice cookie? Really terrific flavors! Thanks for the comment. I don't recall Mom making these at Christmas, John. She just wasn't one to use coconut very often. I do know these cookies, though, and I cannot recall the source. Dang! I'm getting too old to remember who cooked what cookies. Similar to when I tended bar, there was a time where I might not have remembered your name but I sure knew what kind of cookies you served or brought to the house. These were some tasty cookies with a great crunch, as I recall. Thanks for reminding me of them, John. Wishing you and Mrs. Kitchens Riffs a wonderful Christmas and every Happiness in the New Year! Hi John, the flavor of these is quite nice, IMO, and the crunch is fun. You've probably had these - or a close variation - at least several times (although maybe not with the coconut). It's one of those cookies that I vaguely recall as being pretty popular in the 50s and 60s, and I still see it around frequently. Thanks for the greetings and comment, and Merry Christmas! These cookies are totally new to me and I have to say they are very interesting. I'm going to try out the microwave idea! Hi Sawsan, these are a fun cookie! I hadn't had them for a few years until Mrs K R made them recently, and I forgot how wonderful they are. Thanks for the comment and greeting, and Merry Christmas! Hi Ilan, they're great! And I'm glad you like the idea I suggested on your blog to temper chocolate in the microwave. Thanks for commenting. Oh, Rice Krispies! I bet those cookies are crunch-a-licious. Loved how you decorated the tops so distinctively, too. Hi Carolyn, I used to love the snap! crackle! pop! Rice Krispies commercial when I was a kid. ;-) But I much prefer using the cereal in these cookies rather than as, well, cereal. ;-) Thanks for the comment. These look really crisp. That's something that I can't manage at the moment with my cookies because of the humidity here. They absorb the moisture in the air almost immediately after they come out of the oven and never crisp up properly. Hi Suzanne, these cookies are indeed crisp, and they'll hold up to some humidity, but not the extreme summer humidity that I suppose you are experiencing. Thanks for the comment and greeting, and Merry Christmas to you and yours. Hi Christine, it's a fun cookie. It has a pretty simple flavor, but one I find mighty appealing, and I hope you will, too. ;-) Thanks for your comment. I love your beautiful, old-fashioned cookies! And I couldn't agree more about using pure vanilla - I always think cookies reflect the quality of the ingredients that go into them. I wish you and your family a belated Christmas! Your crunchy cookies look great and they would go well with my camomile tea now. I have been experimenting with rice crispies and oats lately and I realized that I like using these ingredients together in bars. Thank you for sharing your recipe! Hi Beth, glad you enjoy the cookies! And although good vanilla is more expensive than the imitation stuff, the difference in quality is huge. Thanks for commenting! Hi Helene, thanks for the greeting (and comment! ), and I hope your holiday was great, too. This is a great cookie to pair with tea. And you're right that the rice crisps and oats work well together in bars - not something we often do, but it's a great idea. My mom did the same thing every Christmas. Then she would hide them, knowing we would find them but she thought they tasted better if they were a bit forbidden. I love your cookies, these would be my favorites too! Love the coconut in these cookies! 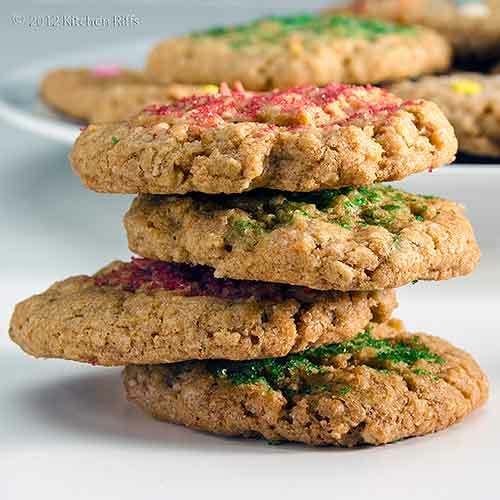 I like crisp texture for the cookies rather than chewy and these cookies sound and look fabulous! My children would love these colors on the cookies too! Hi Chris, searching for cookies must have been fun. ;-) And I can get into the forbidden part! Thanks for your comment. Hi Nami, I really like crisp, too, although I certainly wouldn't turn my nose up at chewy! Thanks for the comment. It was the same for me growing up, and December is still my favorite month of the year because of all of the baking!!! These cookies look great. I would love to try one with a hot drink to dip them in :) I hope you had a very Merry Christmas! Hi Kristi, we had a great Christmas, and I hope you did too (how could you not, vacationing to Germany?). December baking really is special, isn't it? Thanks for the comment. Hi Terra, this really is a busy time of the year, isn't it? I'm having trouble keeping up too! I really enjoyed having this cookie again - it has terrific flavor. Thanks for the comment. Super yum! So are these crunchy just from the rice cereal or is this more of a crispy cookie? Hi Food Jaunts, they are crispy both from the cereal, and because by nature they're a pretty crisp cookie. But the cereal definitely makes them still crispier, so you the best of both worlds! Thanks for your comment. Mrs Kitchen Riffs is a cookie genius. I love coconut. And cookies. Hope your holidays were fabulous! Hi Ki, Mrs K R does know a thing or two about cookies. The coconut in these is really nice - since you like coconut, this cookie is probably calling your name. ;-) Our holidays have been great, as I hope yours have been. Thanks for the comment.